Much gnashing of teeth and ire has been going on since Rangers’ latest ‘one step forward two steps back’ episode. Rangers haven’t won at Rugby Park in the league since Kyle Lafferty’s title-winning hat trick in May 2011. While there’s been the Journey and a weaker Rangers, yes, not even a strong Nikica Jelavic-endowed side could get a win at this venue in late 2011, and since then every league meeting has been either a draw or a loss for the visiting side. So while there are no doubts Rangers’ display last night was simply not good enough, it must remembered the various XIs in the blue to have travelled to Ayrshire over the past eight years have also failed to registered a win. The only exceptions are cup wins earlier this season and in recent seasons, but the rules in the cup are always different. Killie have been Rangers’ league bogey team for a very, very long time – and while it doesn’t make last night’s loss easier to take, they have history for big results against us. 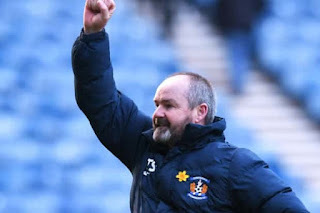 Furthermore, something else forgotten in the ether is Celtic also lost at Rugby Park this season, and Steve Clarke’s side have become a deep dark horse in this league as a result. So, yes, it was bad, but let’s see how things go this weekend v Livi before completely losing the plot. Realistically I think that’s the league over for us we are simply too inconsistent. “1 step forward 2 back management approach” doesn’t look it will change anytime soon. What a stupid comment. How many Champions League medals does Brendan Rodgers have. You disrespect the finest British player of his generation. Its not over till the fat lady sings! Its a blow no doubt about that but there will be plenty of twists before May. There is not much between the top 4 at the moment and even St Johnstone are not far off the top. I agree, remember helicopter Sunday. Two games remaining and 5pts adrift in that campaign.....well the rest is history as Gers won the title by 1pt. Yes, there will be twists and turns. As Marvin said BELIEVE. Rangers are you happy now, you've cost us the season??? Well done, bravo! Pathetic, this Killie carry on. All that money and we STILL, lose. Raging. Ironic that it was Jones who put and end, to our season. Still not good enough. We will never win the league with this team or management. There is no improvement whatsoever in the league as per previous seasons. This January window was vital and we are handing Celtic the league on a plate, they are not winning the league, we are giving them it!! Below is all the points we have dropped in the league so far. If you think we can win the league this season, then you are deluded. January window was vital to add quality to our team and have failed. It's obvious we are short 2 centre halves, a "quality" midfielder who can pass to the striker and indeed a "quality" striker, because Defoe ain't it!! It's going to be the same old shite in this half of the season, nothing to suggest otherwise, no where near good enough and unacceptable. Gerrard and his staff are out of their depth to the size of our club, the gamble is not paying off!!! Have a good look at these results, and tell me if you see us getting any better after yesterdays result against Killie. Our team are one game wonders, then down tools!! Utter rubbish!! This looks to me like a list of difficult fixtures apart from Livingston and Dundee. There are also 6 draws in there, most of which we deserved to win, remember the late concessions at Motherwell and Aberdeen and the perfectly good Lafferty goal ruled out at Dundee. Draws at Pittodrie, Fir Park and Easter Road are better results then many more distinguished Rangers teams managed. And our 4 defeats are by the odd goal. My point? There is a very thin dividing line between success and failure. How much different would your list have been had we held on at Aberdeen and Motherwell, if Laffertys goal had stood, had we been awarded the blatant penalty at Easter Road or indeed had we taken one of the dozen chances we created. Interesting thing for me is that in nearly every case the team that we dropped points to never won their next match. A sign I think that these teams raise their game when they play us and are exhausted for their next match. With 2 old firm games still to be played we have a chance. Realistically? I think its now over. We cant rely on the defence, we dont create anywhere near enough clear scoring chances and alfredo is non existent when playing with a strike partner. Too many times we havent showed up. Too many stupid points dropped, its not anywhere near league winning form. Do we really trust them to win every game from now on?? I really hope im still just gutted from last night and they prove me wrong. The bheasts have got an easy few weeks which is going to let them build momentum and put us under pressure away to livingston and the sheep! Controversial idea but anybody think a lafferty/defoe partnership could be our best option? I think it could be but if we benched alfredo his value would drop and we cant afford that. EMcC is spot on. Even St Johnstone are not far off the top. The problem is we toil against any of them. Septic always seem to get the points without much of a struggle. Have to say, I think changing the system was a mistake. And players should have to earn their way in to the team. McCrorie did nothing to deserve being dropped for Davis. Candeias has been outstanding, yet was dropped for Defoe, along with a change of formation, away from home, against one of the strongest teams in the league. Worrall has made errors repeatedly, yet stays in the team. WTF? Im not saying you are wrong but if you try to bleed and Davis, and in particular Defoe into the team then they will never get up to match speed. That would render signing both of them a waste of time. Fair point Rob, but I am only talking about away from home against Sheep, scum and Killie. Even over a whole season, that is only 6 of 36 matches. But over January/February, they would only have missed 2 games. Gives plenty of opportunity to get them up to speed. Pity we started changes away at Killie. A lot of "if only" in your comment Rob. The fact is, we didn't! We are not scoring and we are not defending, and that is costing us vital points. Story of our lives since we have been promoted into the SPFL. To all these Clubs, bar celtic, it's a cup final playing against Rangers, both home and away and they work hard accordingly. We do not have the same attitude against the other Clubs, that is our failing and why we are being crippled by inconsistency.